What’s the point of competition in high school sports? What are the teachable moments, and what are the costs? Subjective as the possible answers may be, I’ve been thinking about the purpose of competition. My interest was sparked by this funny scene in Billy Crystal’s 2012 comedy hit, Parental Guidance. (Click on the image to launch the video). (In the video, Billy Crystal’s grandson is pitching at a little league game. The grandson strikes out the batter, but he’s not “out.” Upon confronting the umpire, Crystal’s character learns that they don’t count strikes in the league and the don’t keep score). Crystal’s character wants to dole out some tough love, while the parents insulate their kids from failure. By removing failure from the game, they may also empty it of competition. The impetus for this post was not a movie, but a real life story from an athletic booster club that I visited. I spoke to an athletic director who felt pressure from parents about his team’s scoring. It’s not that they scored too little… they scored too much! Parents from opposing teams have complained about blowouts his team has delivered, asking his team to win by less or end games early to prevent embarrassing losses. 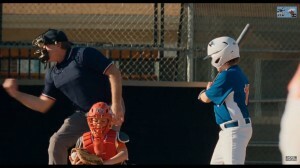 If the scene from Parental Guidance is parody, then the athletic director’s story reflects its real-world inspiration. On the one hand, I think we can see why a league would want to cap scores to keep games friendly. It’s hard to see your kids lose. It’s easy for children to feel judged and take a game too seriously. There’s also more to sport than competition. Practice, teamwork, and exercise all support good development. On the other hand, there’s something valuable in suffering a loss, in eating some dust and coming back for more. When you can’t win or lose, are you missing out on the character building that comes from learning to win and lose gracefully? Or will players with strong ability stop pushing themselves? And will those who are weaker forfeit their opportunity to improve? Perhaps there’s a middle ground. Perhaps “decompetification” is more appropriate for some age groups and not others. What do you think? I’d love to hear from readers on that question. In addition to the very practical posts on Boosterland about fundraisers and 501(c)(3)s, I hope we can come together and discuss deeper questions about our work. Serious questions not only help us communicate how we generate value for the community, but also empower booster club volunteers to understand their own work. For example, why do booster clubs need to exist? What role do extracurriculars have in preparing young people for the world beyond high school?